This section offers some key planning information for those considering replacing an existing building or construction an entirely new building from pre-engineered steel. We touched on parts of the planning stage in the previous page of our Buyer’s Guide, Project Design & Planning. Here, we’re going to expand on the planning stage, starting with the two major factors to consider: practical and legal. You will need to think through exactly how you’ll use the building. For example, if you’re building a warehouse, you may need roll-up doors high enough for your forklifts to drive through. Steel buildings always require foundations. In many cases, these are flat concrete slabs. However, another type may be more practical for your use. If these are not readily available at the site you have chosen, you may have to pay extra to create them or bring them to your site. Every state has different building codes that will apply to your project. These will include things like snow and wind load, and how much your building can withstand each. Building codes are continually changing, so be sure to check with your city or county planning department. For example, if you’re building a church or emergency vehicle garage, what are called “importance factors” may apply and raise the bar even higher on code requirements. Other legal requirements include local zoning laws, drainage requirements, and energy codes. 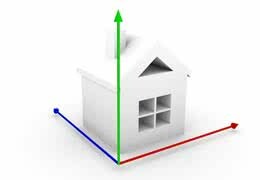 Stricter energy codes require the use of more insulation to save energy and reduce your building’s carbon footprint through the application of Green building standards. While perhaps more costly at first, following the newer insulation guidelines will make your building energy-efficient and could very well pay for itself in the first year because of reduced heating and cooling costs. Some aspects of your design involve both practical and legal considerations. For example, a retail facility will need, and legally require, appropriate parking and handicapped access. While steel building suppliers can often help you research these codes, most will not engineer, fabricate, or ship you a building that does not meet the codes in your area. So ultimately the responsibility for meeting them is yours. If you’re not familiar with major construction projects—and especially steel building installations—it is advisable to consult with a local contractor. You will likely be using one for your site prep and construction anyway. Perhaps it would be a good idea to start a dialog with one in your area. Prevailing wind directions and sun exposure may be important to you, depending on the intended use. For example, do you want to have the sun shining in the windows in the morning, early afternoon, or early evening? Might you want to eliminate windows and doors from one side altogether that may get regularly buffeted by the wind? Is there a view that should be considered? These are just some questions you will want to consider. It is usually wise to plan on purchasing a building larger than you initially think you might need – you WILL grow into the extra space! A good rule of thumb is to go one size larger so that future requirements can be accommodated without having to do an extensive remodel. 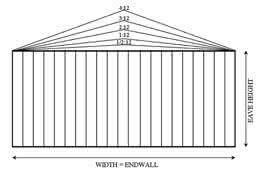 Standard dimensions are calculated in increments of 10 feet, e.g., 20’ x 30’ or 60 feet by 100 feet. Custom sizes can be created, but that would significantly increase the cost. Some of the most common standard steel building sizes include: 30×40, 60×40, 50×100 and 60×120. Community buildings generally have heights that vary, while standard heights of single- and multi-story buildings are usually governed by local code. As a rule, building eave height must be at least two feet taller than the highest framed opening (see below). Based on the type and style of the building along with its proposed use, you can calculate the roof height. For example, aircraft hangars need to use the clear span style with high roof structures. Churches may need high vaulted ceilings to give a feeling of loftiness. With business offices, standard roof height is usually sufficient. The shape of the roof can be designed based on the amount of clear space required in the middle of the room. Roof slope is expressed by the “roof pitch ratio” which is the number of inches of rise in 12 inches of horizontal length—with a colon between the two numbers. For example, a roof with a pitch of 2:12 (“two in twelve”) means that it slopes up two inches for every 12 inches of length (or two feet for every 12 feet of length). 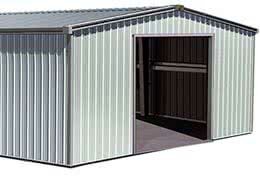 A basic metal building has a roof pitch of 1:12, a nearly flat roof. Gabled buildings typically have a roof pitch ratio of 4:12. Higher-pitched roofs provide more cubic footage of space for a slight increase in cost. They are beneficial if you can utilize the space above the eaves. On the other hand, low-pitched roofs allow you to heat and cool the space more efficiently. Snow load is another consideration if your building will be in an area with significant snowfall. A steeper roof pitch will shed snow better. A “framed opening” is term used to describe any opening in the building, covered by a door or not, which is larger than a “walk-door” (a door which people go through). They are generally large openings through which vehicles, large equipment, and loading items pass through. A garage doorway would be considered a framed opening, for example. Schools, retail stores, and manufacturing facilities often have a loading bay area, closed off by a massive door, which trucks can back up to in order to deliver or pick up large or a great number of items.